Care managers or case managers have diverse skills that are needed to help chronically ill patients navigate the complex challenges of today’s health systems. Organization, communication, problem-solving and empathy are just some of the traits utilized in this rewarding field. As our population ages, the need for qualified case or care managers will increase at a staggering rate. Do you have the characteristics and skills that can help meet this growing need? Click HERE to sign up for your FREE eBook! 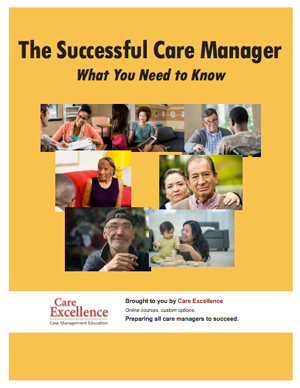 Enjoy this practical guide to what makes up a successful care manager and discover whether this fulfilling career might be for you! Check Out Our Case Management Education Opportunities! Foundational – Essential skills for those new to case or care management, and those who would benefit from a review of fundamental knowledge and skills. The content is applicable to nurse case managers, social work case managers, and all care managers and care coordinators, working with all patient populations. 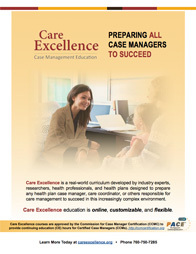 Advanced Concepts – Curriculum for experienced care managers and other case management professionals working with growing and diverse populations with special and complex needs, whose responsibilities also include decreasing cost of care and improving the member’s quality of care. Leadership – These courses teach supervisors, managers, and others in health plan leadership roles how to effectively supervise and mentor their case management teams. Give us a call with your questions at: 760-750-4006.